Phnom Penh (FN), Feb. 19 - After a surprise Facebook post that amounts to have interfered into Cambodia’s internal affairs and its judicial power - a serious violation on Cambodia’s Sovereignty and Independence - the head of U.S. Embassy’s Public Affairs Section and spokesperson Arend Zwartjes, apparently the one behind the mission’s most controversial social media consecutive postings that have recently sparked rhetoric rows between Cambodia and the States, has confessed the mission’s notorious attempt on Cambodia - a move that nullified President Donald Trump’s declaration that the U.S. would never employ regime change policy on other countries again. In an interview with RFA, Arend Zwartjes explained two reasons the United States of America (U.S.A) intervened and called for Kem Sokha’s justice: 1) the U.S. has the rights as a signatory state of the Paris Peace Accord, and 2) the U.S. was blamed as the one who backed ‘color revolution’ led by Kem Sokha and Sam Rainsy of the former Cambodia’s National Rescue Party. This was the first time the U.S. diplomat admitted in person and openly that they had intervened into other Cambodia’s internal affairs - an interference in a sovereign and independent state’s judicial organization. The act also violated the UN Charter and the principles of diplomatic protocol. The politically motivated claim by the biased and arrogant U.S. diplomat is a correct proof that the U.S. is ‘the opposition’s patron’, but certainly not Cambodia’s. They could not command Cambodia like what they did with the opposition and they cannot violate Cambodia’s rights, too. As a diplomat from a civilized nation - a nation who claimed itself as the master of Human Rights, Democracy and Rule of Law - Arend Zwartjes should have twisted 1,000 times his tongue before commenting on something because what he raised, showed clearly how bad the intention of the diplomat was and how he disrespected the Article 41 of the 1961 Vienna Convention on Diplomatic Relationship which requires especially the U.S. Embassy in Phnom Penh to obey the rules and regulations and not to interfere into Cambodia’s internal affairs. 1. the U.S.’s intervention as a signatory state of the Paris Peace Accords: Arend Zwartjes might have not gone through all the articles of the Accords and may haven’t thoroughly read and understood Cambodia’s constitution before he voiced his notorious intention. If he doesn’t know Khmer, he should have Khmer staff in the embassy translated and explained him. All main concepts of the accords had been incorporated in Cambodia’s constitution - the top law of the country. Cambodia observed the accord when it did not have the Constitution, but now it has the Constitution. Other states, including the U.S., should also observe Cambodia’s constitution and laws when they talked about Cambodia and did anything related to Cambodia - since every member of the UN deserves equal right and treatment. If Arend Zwartjes made reference to the Paris Peace Accord, he should pay attention to Part 4 - Article 18 which states that ‘Cambodia promises to safeguard and other signatory states promise to recognize and abide by Cambodia’s sovereignty, independence, integrity, non-invasion, non-alignment and uniformity. This shows clearly that the U.S. must abide by Cambodia’s sovereignty by not interfering into the country’s judicial power. Therefore, what Arend Zwartjes claimed the U.S. intervened to find justice for Kem Sokha was just an excuse to hide its violation of international laws and to clumsily defend its pawn. The U.S. has no rights to interfere into Cambodia’s internal affairs and to violate the country’s sovereignty and independence. 2. The U.S. intervened because there was the allegations that the U.S. involved directly in Kem Sokha’s treason legal case: Who linked the U.S. involvement in the ‘so-called color revolution’ which aims for the former CNRP to seize power in an undemocratic way? 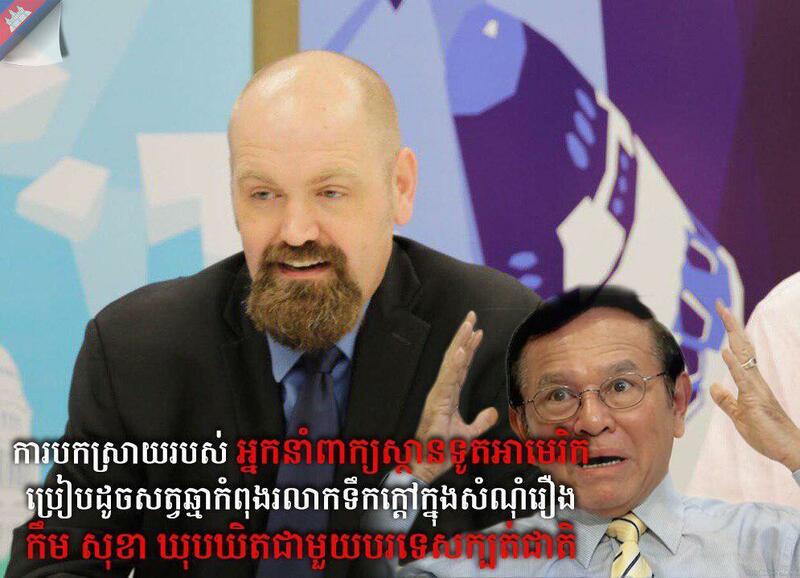 Arend Zwartjes and his colleagues should stop pretending ‘deaf and dumb’ to what Kem Sokha had raised proudly about the U.S. support in an attempt to overthrow Cambodia’s legitimate government using the same model of Color Revolution in the former Yugoslavia. Kem Sokha proudly told a gathering in 2013 in Australia that “...they said if you want to topple one’s leadership, you cannot confront them directly. Before you can overthrow them, you must do it from the grassroots. This is a strategy employed by democratic countries. The United States who has helped me, asked me to take the models from Yugoslavia and Serbia where they toppled dictator Milosevic successfully. Milosevic has a lot of tanks but they managed to do with this strategy and they asked me to take that experience and implement it in Cambodia. No one knows about it. Just because today we have arrived at this stage, I must tell you and if we carry it on, we will be successful. I didn’t do it on my own. I have expertise professors from Washington University and Canada’s Montreal who were hired by the United States to advice me on the strategies to overthrow the government and I followed them. If we followed those strategies but we still fail, I don’t know what to say”. These activities were later confirmed by convicted Sam Rainsy who claimed himself to be one of the masters of ‘color revolution’. The claim made by the U.S. Embassy spokesperson that Cambodia linked the U.S. with the color revolution plan was a mistake and just a cover up, similar to a phrase that the Cambodian people used to say ‘hide the face but expose the buttocks.’ Actually, Cambodia should be thankful to Kem Sokha for revealing such a dangerous and secret plan for the nation and the people. Frankly speaking, without Kem Sokha’s revelation of this plan, Cambodia may have not known the ‘fake friends’ trick and bad intention and Cambodia’s peace, stability and development may have been under jeopardy because the former CNRP, under its foreign boss’s string, persists to turn Cambodia into the same situation in the 1970s. 3. Arend Zwartjes reasserted that the Cambodian Government cannot restore its good relation with the U.S. unless Kem Sokha has been freed and democracy and human rights have been reinstated. This message is a clear indication of a ‘patron nature’ of some nations over a sovereign and independent nation. Article 1 of Cambodia’s constitution stipulates that ‘ Kingdom of Cambodia is an independent, sovereign, peaceful, integral, permanent and non-aligned state’. Cambodia implements the principle of peaceful coexistence with all nations and makes no enemy in line with the motto laid down by Prime Minister Hun Sen to lead the country : ‘Cambodia must conduct a deep reform inside the country and befriend with other states in an independent manner.’ This means that Cambodia strives to live and stand on its own feets by conducting the internal reform and strengthening her friendship with all countries in the world. Therefore, the U.S. Embassy spokesperson should learn and respect Cambodia’s sovereignty because what President Donald Trump told the UN General Assembly was clear. He said ‘In my own name as the U.S. President, I always put the U.S. interest first. Just like all of you, as the leaders in your respective countries, you always think of your country first.’ These were Trump’s words on 19 September 2017. What he mean was that every country, regardless of the size of the country, must do everything possible for the sake of their national interests first and it is the duties of their respective leaders. In Cambodia, what Prime Minister Hun Sen has been striving to fulfill is to put Cambodian people and national interests first. Cambodia has established good relationship and cooperation with other countries, especially Mr. Hun Sen has also enjoyed good relation with other world leaders including President Donald Trump. So, why did the U.S. Embassy staff and spokesperson are trying to intimidate Cambodia which constitutes a move against President Donald Trump statement? Was Arend Zwartjes respecting the law or abusing the law? Was he biased and intended to defame the U.S. credibility and image ? To sum up, the explanations made by the U.S. Embassy staff in Phnom Penh was like ‘a cat in hot water.’ In Kem Sokha’s treason case, the court has never summoned the U.S. representatives while the claim made by this US spokesperson that Cambodia’s government accused the U.S. of backing Kem Sokha was completely unjustified. In fact, it’s Kem Sokha who slipped it from his own mouth to overseas members of former CNRP. Did the U.S. think that the only way to get the U.S. rid of the case was to put pressure on Cambodia’s court to lift the charge against Kem Sokha? Maybe it’s true; that is why they keep going on with exaggeration, intimidation and incitement.